State Sen. Michael Padilla introduced legislation in New Mexico aimed at helping students who can't afford school lunches. We're going to talk now about something called lunch shaming. That's when kids are publicly identified as being from families that can't afford to pay for school lunch, maybe they're identified with a wristband or a hand stamp. But then those kids are bullied or ostracized because of it. 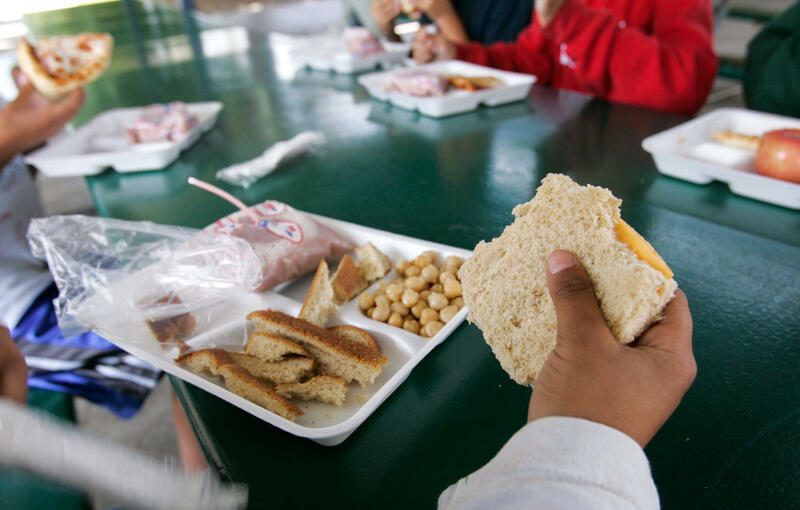 New Mexico has become the first state to make that kind of lunch shaming illegal with something called the Hunger-Free Students Bill of Rights. The bill makes schools talk to parents, not students when the student has cafeteria debt. It also says schools can't force kids to pay off that debt with chores or extra work. Michael Padilla is the Democratic state senator who introduced that bill. We reached him via Skype, and I asked him to describe what exactly lunch shaming looks like. MICHAEL PADILLA: You know, as it turns out, I can actually speak from personal experience. I grew up in foster homes - multiple foster homes. And so my sisters and I grew up that way, and we actually experienced this ourselves. You know, you go to the lunchroom. You have debt or just don't have any money at all. And what they'll do is they'll give you a piece of bread and maybe a little bit of cheese on the bread. And the other kids are getting a warm meal. And, you know, they're moving on with their day, but, you know, these kids are being stigmatized, and they're being - you know, it's very obvious who the poor kids are in the school and this and that. And so that to me is shaming, and that has no place in our society in a first world, you know, powerful country like ours. MARTIN: So children are not just being ostracized or shamed because they can't afford to pay for their own school lunch. You're saying they're actually getting different food. Aren't there federal and state subsidies to get these kids a proper school lunch? PADILLA: Well, that's even further than that. We have specific stories of children that have actually had the hot lunch taken out of their hands and thrown away right in front of the child. PADILLA: By one of the cafeteria workers, you know, or whatever might be going on there. So, you know, again, you know, growing up this way, it was a very, you know, serious hit-home kind of issue. And so, you know, I made Mrs. Ortiz (ph) and Ms. Jackson (ph) my best friends when I was growing up. And they made sure that I ate, but, you know, I had to mop the floors in the cafeteria. I had to put up the chairs and all that stuff. And basically what the legislation does is it changes the focus of the school to getting the children on the free and reduced programming fee schedule or whatever and the schools are still able to collect this debt. They still are able to do that. But really, you know, a 6 year old maybe up up to about a 14 year old, they have no power to fix this issue and to resolve it. So if their parents have debt in the lunchroom, then that is not something that they have control over. And I don't know why we're punishing them so this prohibits that, it outlaws that and it focuses more on the child's well-being rather than the debt itself. MARTIN: So what specifically does this new law do? I mean, how do you prevent these kids from getting shamed in these situations? You say that it's about helping parents pay off their debt but how does that help the public humiliation? PADILLA: Well, it outlaws a different lunch essentially. So everybody going through the food line - which by the way is going to make the lunch line a little more efficient. You know, I've even heard of stories in schools where there's two or three different lunch lines. If you have the regular, you're the regular kid that can pay the whatever no matter what, you know, you're going through the line real quickly getting your hot lunch and going and sitting down. A reduced lunch time might be in another line that gets a different type of lunch, and then the poor kids are in the other line just very quickly being, you know, rushed along with a piece of bread and a piece of cheese. But what the legislation does is it basically eliminates the other two lines, and it puts, you know, all of the kids, you know, moving through with a hot lunch and then they move on with their day in their studies. MARTIN: I mean, it's just - it really is shocking to think about kids in that circumstance. Do you have any sense of how widespread this is? I know you're focused on your state and efforts to address this there but do you have any idea if this is something that is happening across the country? PADILLA: It is happening across the country. Many legislators have already - from across the country have already reached out to get a hold of this legislation as model legislation. And by the way, it is the first in the nation Hunger-Free Students Bill of Rights. New Mexico - we're on a lot of these really bad lists, but we really want to turn that around. I'm very proud to say that, you know, we came together in a bipartisan fashion in our legislature - Democrats and Republicans - and we were able to finally convince the governor to sign this bill. And so I think you're going to see this kind of move its way across the country. 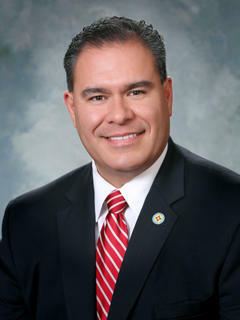 MARTIN: New Mexico State Senator Michael Padilla. Thanks so much for talking with us about this. PADILLA: Thank you very much for taking this on with us. I appreciate it. Transcript provided by NPR, Copyright NPR.